Director Wash Westmoreland and his late partner Richard Glatzer last visited the Toronto International Film Festival with Still Alice, which earned Julianne Moore an Academy Award. Watching that awards ceremony from the ICU before he passed away, Glatzer told his partner that Colette needed to be his next film, and Westmoreland lived up to his promise. While the film has gone through multiple rewrites and incarnations over the years, there may not be a better time for the story of Colette to come to the forefront. Sidonie-Gabrielle Colette (Keira Knightley) is a young woman in the French countryside when she meets Willy (Dominic West), an older gentleman who is a publisher of sorts in Paris. An infatuation leads to marriage and Colette moves to the City of Light where she turns head in her provincial gowns and unfamiliar ways amongst the elite of Paris. While Willy is successful in his business, he quickly burns through any money earned by gambling and other recreation leaving him desperate for his team of writers to come up with new content. He soon recruits Colette to write about her childhood in rural France and the character of Claudine is created with Willy taking all the credit. Claudine takes off, creating a phenomenon – young women dress like her, they make a myriad of merchandise, a play is written. But the demand for Claudine means increased pressure for Colette who begins to realize it’s not just her literary character that belongs to Willy. 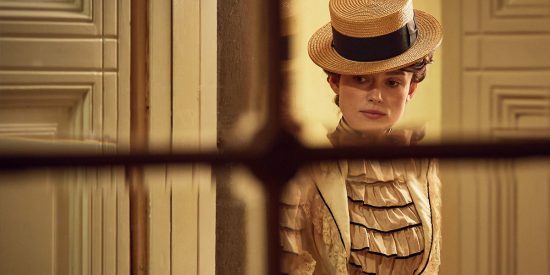 Keira Knightley has made a career out of period drama and with good reason – she’s good in them. She is positively resplendent as the eponymous heroine, portraying her character’s maturation with grace and vulnerability until she becomes the passionate, ardent woman that takes control of her own life. West meanwhile handles Willy with comedic intent, at times bordering on caricature but always grounded through his incredible chemistry with Knightley. As with Still Alice, Westmoreland is gifted at creating rich and strong female characters and telling their stories with a sensitivity that can be lacking in some male directors. Colette is unabashedly feminist telling this coming of age tale of a woman discovering herself, her sexuality and gender identity. Told against sweeping landscapes and set designs along with some beautiful historical costuming, Colette‘s messaging couldn’t be more timely. “It’s the hand that holds the pen that writes history,” the film rightly states. This work and the new generation of people discovering the true Collete’s written words will solidify her place in that history.